Similar to the twitter tattoo auction for charity where this guy was willing to get your name tattooed on him for the Make a Wish Foundation. 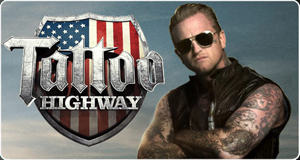 The A&E marketing team has figured out a way to encourage people to spam the Tattoo Highway tv show to all there twitter friends. If you follow @ThomasPendelton on twitter and tweet his hash tag #A&EWed10 and tell him where and why you want your twitter name tattooed on you (in 140 characters or less mind you), then you just might be one of the lucky people who get to have a website tattoo.